This Round Activity Table is a must have for daycare, preschool and early childhood development centers. Enhance collaborative learning by grouping tables together. 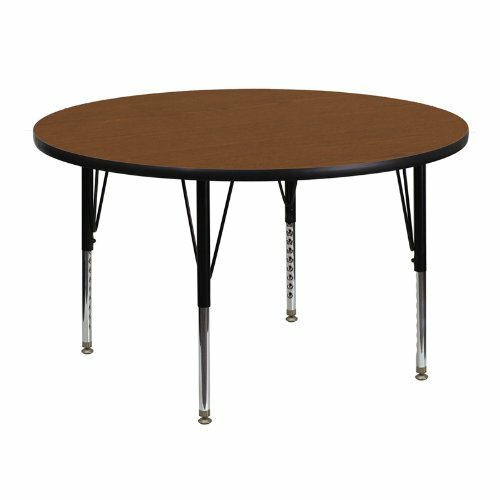 It will accommodate children up to age 7.It features a 48'' high pressure scratch, stain and warp resistant laminate top with a black edge band and 16 gauge tubular steel legs for increased stability. The top incorporates a protective underside backing sheet to prevent moisture absorption and warping. An attractive black powder coated finish protects the upper legs from scratches and height adjustable chrome lower legs give you the flexibility to raise or lower the table a full 9 inches in 1 inch increments. Self-leveling nylon floor glides keep the table from wobbling and protect your floor by sliding smoothly when you need to move it.Perfect for craft time, snack time and party time, this easy to clean table is just the right size for small children. If you have any questions about this product by Flash Furniture, contact us by completing and submitting the form below. If you are looking for a specif part number, please include it with your message.